The Elite Spas brand is built by MAAX Spas manufacturing in Arizona. Elite Spas are roomy and powerful hot tubs that offer luxurious features. There are 11 models of Elite Spas and Hot Tub Outpost carries many replacement spa parts, filters and accessories for them. See our spa filters to find a replacement filter cartridge for your Elite spa. We also offer a wide variety of pumps, controls, jets, plumbing parts, covers and other accessories that fit Maax Elite spas. Filters used in Elite spas vary by size and connection. Be sure to verify size and end cap style (threaded, center hole..) before ordering. 8 inch long filter FC-0300 with 1 1/2 inch threaded connection on bottom and a top handle (closed). We offer a wide variety of Elite Spa plumbing, spa controls, heaters, pumps and other spa parts. Need the whole control panel? We have those too. Contact us if you need assistance finding the right topside control panel or overlay for your Elite Spa. Model 4100 measures 82.5" square with room for 6, and features45 massage jets, a 2 speed 6.0 HP pump, a 5.5 kW heater, a CleanZone system, a water feature and deluxe walk on cover. 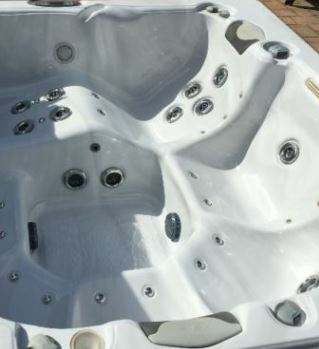 Elite Spas model 4200 is also 82.5" square, with a lounger, 2 spa pumps, 42 hydrotherapy jets, a 5.5 kW heater and an illuminated water feature. Model 4300 is 82.5" square hot tub with molded seating for 6, 2 spa pumps, 52 massage jets, a 5.5 kw spa heater and an AeroMAAX system. Model 4400 fits 6-7 persons in a 91" square shell with 56 jets, 2 pumps, a Clean Zone UV system and a foot relief station. Model 4600 is also 91" square, with a massage lounge seat, room for 6, 56 hydrotherapy jets, a heater and 2 spa pumps. Elite Spa has additional features in the models with higher numbers, like the following: Elite Spas Model 5100 measures 66" x 83" x 30.5", features a lounger, 33 spa jets and room for 3 persons. 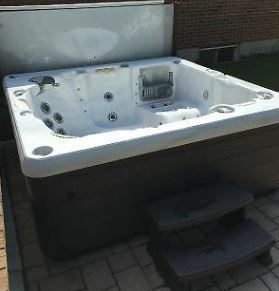 Model 7000 is an 83" square spa with 54 hydrotherapy jets, room for 6, 2 spa pumps, a heater, a ClearMaax filtration system, Bluetooth music system and a 20" waterfall. Model 7500 is an 83" square spa with ergonomic seating for 6-7 persons, 2 spa pumps, 50 stainless steel jets, foot and neck relief stations plus Chromo Therapy. Model 8000 seats 6 persons in a 92" square shell with a massage lounger, 54 stainless steel jets, 2 dual speed spa pumps, BackMaax, a CleanZone UV system and Aero Maxx system. Model 8500 in the Elite Spa line measures 92" and fits 6-7 persons in molded seats. This hot tub has 50 stainless steel jets, 2 dual speed spa pumps, a 5.5 kW heater, Chromotherapy, Aero Maax system and UV system. The signatureES model by Elite Spasis a 92" square shell with a full body lounger, room for 6 persons, 80 stainless steel massage jets, 2 x dual speed pumps plus a single speed spa pump, a 5.5 kW heater and Bluetooth music system. Contact us at support@HotTubOutpost.com if you need assistance in finding the right spa part or accessory for your Elite Spa hot tub - send details/part number/even a picture along with your request if you like. We know you'll want to get back to enjoying your Elite Spas hot tub, so we'll get back to you quickly. Hot Tub Outpost is an independent spa parts dealer and is not affiliated with Maax/Coleman or Elite Spas.